Modern styling with unique family crest slate plaques. Hand-painted copper metal plates are beautifully displayed in a contemporary fashion. Beautify your Home or Office with one of these fine personalized Family Crest Slate Plaques. Unusual Gifts that really look great. Supplied with a meaning of symbols on back. Size 12 x 8 inches approx. Real Slate. 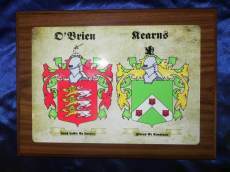 Gorgeous Hand-Painted Family Crests on Copper Plates. 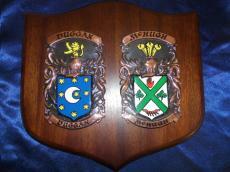 Gorgeous hand-painted Copper Plates on a Slate Plaque Shield and presented in a fine gift box. 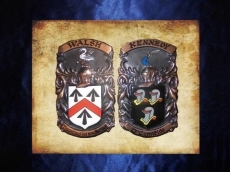 Authentic and Researched Family Crests.